Please write “HEATHER MURRAY” on the check memo line or in the memo or account field in your online bill payer. 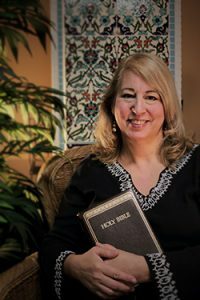 Since 1985, Heather has worked in world missions, 12 years of church planting in Turkey, 14 years working with International students on US university campuses, and working with immigrants and refugees. Before coming on staff with IFI she worked on staff with Frontiers Mission and the Missionary Church denomination. She now serves with IFI in Ann Arbor, Michigan. She helps with Bible studies, English classes, and planning and running student events and activities. One of the most rewarding parts of her job is visiting women one on one in their homes, where they often talk about God and his kingdom. Heather came to Christ at age 18 during her first year of college. She graduated from Gordon Conwell Theological seminary with a degree in cross-cultural studies. Her hobbies are fine arts, camping, hiking and anything outdoors.